Minnesota Palestine solidarity activists target SodaStream | Fight Back! 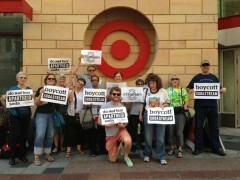 (Fight Back!News/Staff) Protest urges shoppers not to buy products from SodaStream. 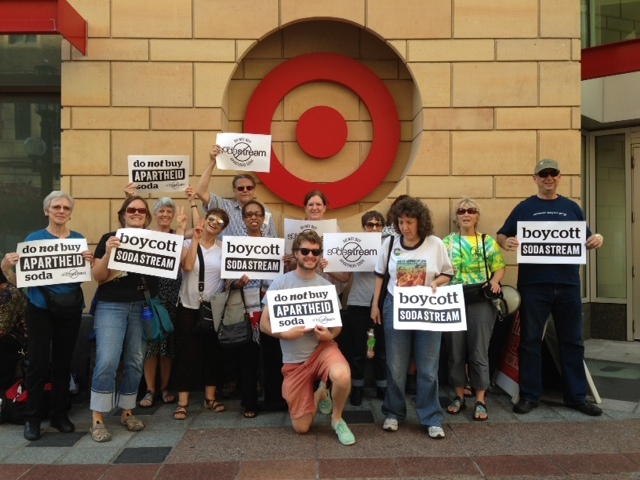 Minneapolis, MN - On Sept. 19, activists with the Minnesota Coalition for Palestinian Rights will return to the downtown Minneapolis Target store, urging shoppers not to buy products from SodaStream. This will follow a successful Aug. 15 mobilization, where 30 people held signs, chanted and passed out informational flyers to hundreds of pedestrians. Sold at Minnesota-based Target stores, SodaStream is a company that manufactures home carbonation systems at a plant in the largest Israeli Jewish settlement on the West Bank. The construction of hundreds of settlements in the West Bank has been condemned by numerous human rights organizations, including Amnesty International, for violating international law and Palestinian human rights. The Minnesota campaign opened a few months ago with a letter initiated by Jewish Voices for Peace, which called on Target to discontinue sales of SodaStream products because the company is in violation of international law and in violation of Target’s ethical standards and Social Compliance Program. This is effort is part of an international campaign of boycotts, divestment and sanctions (BDS) against Israel until it complies with international law and Palestinian rights. A truly global movement against Israeli Apartheid is rapidly emerging.